KEEP IN MIND IF YOU ARE READING THIS, YOU SHOULD HAVE WATCHED THIS EPISODE AS THIS POST AND COMMENTS WILL CONTAIN SPOILERS! Bastille Day: Deciding to use the thousand prisoners on a prison transport ship to mine the ice on the planet they’ve found, Galactica’s plans are upset when a political prisoner onboard leads an uprising, taking hostages. He questions the legitimacy of Roslin’s government and demands free elections to be held in the fleet. This episode is one that really shows why this series is/was so great. This episode is about needing prisoners to mine water out of a moon in space otherwise everyone is going to die BUT it is also about democracy and class warfare. In a new world is everyone equal? Can society go on? Is sticking with the rules the only way to survive? Do the old rules stick? Also it might just be me but I don’t care about still on the planet Boomer. And thats saying something if you know how I feel about Asians. Also if these get popular enough I may open a forum for it, but lets take it one step at a time. And remember if you want to join movie club you can watch what we watch many ways but if you use Netflix.com/PhillyD you get a free month trial of streaming movies/tv shows and it helps us out here. DAM YOU why did you intruduce me to this great series i have been watching constantly since yesterday im currently on season 4!!! Oh and this episode is great fav part is the overall conflicts between the human morality grey zone thingie and the aädlaödlHOTasödlk Tricia Helfer. Ya BSG loves to play in the grey. A lot. Phil when you said you where watching this in a vlog a while ago I was like ‘I’ve been meaning to try it!’ So I did and I’m now onto Season 3! I love how you introduce me to YouTube (Got me making vlogs!) this website! and BSG!! I LOVE YO FACE!! Hey Phil! I was originally gonna make this into a video but go lazy. Gotta say picking BSG first on ur series lineup is by far the best choice you could have made. Although Ive seen the entire series its nice to see other people appreciate this gem of a series. I have a question for you to maybe even discuss in ur next PDS. If you were dropped into the BSG universe, where do you see yourself? Would you be one of Tyrols deck hands? or perhaps an Officer in the CIC? Orrr would you be a pilot?And if you picked option 3, what would be you call sign?? Option 3 and my call sign would be Dr. Alpha. I don’t know why. So what I said about the last episode that I didn’t like the President, well I feel like I like her again after watching this one. Maybe it’s that she has cancer, or that she was receptive to the election (or more so than I was expecting at least). But so far I really like that about BSG, the characters are developing with a depth you don’t normally see in SciFi writing. Also, specialist Tyroll biting off that dude’s ear; what a badass! I am literally so mad at your timing Phil! The day you decided on BSG, I was on the season finale. I have been doing mad BSG marathons. God I love this show. Damn you to hell!!! I was in the middle of season 3 when you started with the pilot. I was going my own speed. Now I have to watch it again from the beginning and day after day and my imaginary rock’n’roll life is over. Not that bad after all though.. The first season is the best one and this might be one of the best episodes in the whole series. Helo and Boomer are boring, but Lee makes this episode what it is. Lee’s interpretation of Tom’s words at the end is one of the reasons why I so loved this character the first time I watched the series. Are you gonna watch Firefly next? I would really like to see your comments on this piece of awesome sci-fi. damn…….i have been trying to avoid downloading this series, because i know if i download it im gonna watch it right the way through at least twice and then when ever i get bored………. Watched this awesome series a while back, thanks for giving me an excuse to go back and re-watch it. Got to give BSG the love. one of the less happy sci-fi’s. I love how realistic it seems.. no mecha of aliens coming along to help them out or whatever. just deep dark space. I actually started watching this show a while back. Like someone mentioned earlier, I love how the series spends most of it’s time in that grey area between right and wrong. The series also hits a lot on human nature. Yes, people screw up. Yes, we fight about stupid stuff. Yes, we disagree, fight each other, berate each other, and sometimes kill each other. But there are also those times of pure selflessness and mercy that only human nature can provide. Ok I’m a little confused… I’m Filipino so I’m not racist. Is that Asian girl that is with the Chief the same girl as the Asian chick on the cylon controlled planet with that one dude. or she she a copy like that one guy who had bombs strapped on his body? she’s a copy, but i think at this point, it is not supposed to be clear to the audience whether or not she is. yes it is supposed to be clear. clear to everyone that watched the mini-series first. Sorry Can’t do that HAW HAW HAW HAW HAW HAW. SexyJack: I said GO AWAY!! Funny I’ve just found this one out on bing! AAAH! God I can’t stop watching. My favorite character right now is probably Helo, idk. Used to be Zarek, but as the show goes on the characters’ personalities either change, or maybe you just see them more clearly Thank you for giving me something else to watch on Netflix besides Prison Break and 24. Oh yeah Phil, you have to watch Heroes after Dr Who. Because Heroes is awesome. So, I’m curious to see if anyone finishes the series and what they have to say about it after it’s all over. Also, damn you for getting me to watch this again. I binge watched it before, and i’m binge watching it now. I seriously dislike this movie thing. A lot of people cannot access Netflix because they are overseas. I guess it’d be awesome if I was in the states, but you’re totally ignoring your overseas viewers. Zarek is going to end the human race at the rate he’s going. They don’t have a stable enough society to even run an election. Apollo should’ve punched him out b4 sprinting out of his cell to fight the entire prison. I haven’t gotten up to this episode but I watched the whole miniseries last night starting at midnight…. yeah… Phil, once again your opinions are always right. And Ive already watched every Doctor Who episode, so i’ll catch up on BSG next week. BTW Dr. Who series 6 premiere on BBC America tonight! Woot Woot! I could not find a better place to talk about this, so thought I would go here. I just finished watching Season 2, Ep 10. I started watching because of you Phil. This is the single greatest episode that I have ever seen for any show. Ever. I codeword the episode Pegasus. If there was a way I could talk without giving away spoilers, I would, but this spoke to me in so many ways, and I don’t even know how they could top it. I hope everyone here watches up till this point, so they too may know the idea of morally grey. I have watched 74 of 76 episodes of this show in the past 2 weeks. One of my favorite shows of all time, I don’t want it to end! 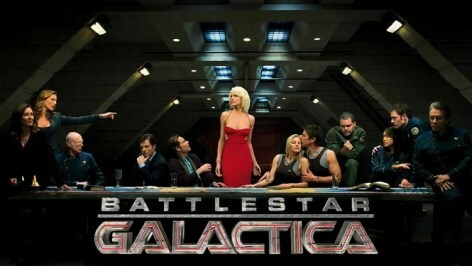 Alright so gunna be honest Battlestar is probably thee best tv series I ahve ever seen. I would watch seasons at a time. I would watch them in marathons and when I finished the show I cried because it was amazing. I’m digging this BSG series. I’ve been up late every night watching the episodes…they are definitely addictive. Thanks for recommending it Phil. BTW… another great series to watch for movie club would be Spartacus… its awesome and all the episodes are on Netflix streaming. I am a huge movie person and hardly EVER watch TV, I have heard of this series before and a couple friends talked about it but it didn’t seem to big of a fuss. I want to thank you for mentioning it on the Movie Club because It is honestly like a very long movie. From beginning to end the writers and producers do an amazing job making this story feel realistic, you build up to love/hate characters and even the ending was well thought out. I hated the ending much like I hate every ending of good movies, simply because I don’t want the story to end. GREAT find, I will be watching this again very soon. Hopefully not in a binge manner like i did this time. The episodes are so darn addictive i was finding myself at 1am saying.. I can squeeze one more episode in… I can make it on 4 hours of sleep at work! hahaha, cheers!